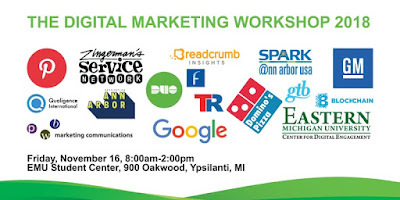 November 16, 2018 Center for Digital Engagement hosted The Digital Marketing Workshop. The sold out workshop featured two keynote speakers, four moderators, fourteen panelists, and fourteen CDE student summer clinic interns from 2018. At 7:30 AM, a line of attendees waited to receive their welcome package and name tag. Networking and breakfast began. Starting off the event we had a thank you from the Director of CDE, Bud Gibson, followed by the Dean of Marketing at EMU, Dr, Kenneth R. Lord. In one room Knowing Your Customer moderated by Kim Brown of Duo Security. There were panelists from General Motors, Zingerman's Service Network, and Breadcrumb Insights. In another is Dr. Russ Merz, Professor of Marketing at EMU whom moderated New Face of Digital. Panelists from GTB, Emetry, Ann Arbor SPARK, and an insightful Blockchain consultant. During a coffee break between panels, this past summer interns with CDE discussed how their experience was with their matched startup companies and with CDE. Twelve of the twenty five interns came equip with laptops to show slide shows of their responsibilities, challenges, and successes. In one room Social Targeting moderated by Jamie Ward, Professor of Public Relations at EMU. There were panelists from Pinterest, Domino's, and Google. In another room was Matt Sauber, marketing professor at EMU that moderated Finding and Using Data. Panelists from Destination Ann Arbor, Overflow Marketing Solutions, PWB Marketing Communications, and 734 Brewing. Closing near the end of The Digital Marketing Workshop lunch was served. Then came Steve Lowisz, CEO of Qualigence who commanded the room in an inspiring presentation. More blogs to come on The Digital Marketing Workshop.